Two gray reef sharks glided effortlessly across our path, their razor-sharp teeth gleaming in the beams of our flashlights. In that moment, nothing else was visible in our pitch-black underwater world. Yet knowing that most sharks are harmless to divers differs greatly from swimming face to face with the hungry predators. My heart raced and my breathing quickened until the sharks swam away. This type of adventure awaits visitors to the Australia’s Great Barrier Reef, one of the world’s most unique and spectacular marine spectacles. Some 400 different kinds of corals, 1,500 types of fish, and many thousands of species of mollusks and sponges inhabit the 1,400-mile long Reef off the coast of Queensland, Australia’s northeastern state. This amazing environment attracts scuba enthusiasts from all over the world, including experienced divers like my brother Dan Johanson and beginners like myself. In fact, the prospect of exploring the Reef with my brother motivated me to learn to dive. Our outing brought us together with 30 other divers, among them Kiwis, Swedes, Germans, Koreans, and Japanese. We met in the city of Cairns, an adventurer’s paradise where, in addition to scuba diving, visitors can enjoy ballooning, skydiving, bungee jumping, spelunking, horseback riding and white-water rafting. The city’s appeal to explorers of old is still apparent in the restaurants and bars of the Esplanade district. Order a plate of ribs and a beer in the Rattle and Hum eatery, and you’ll get portions of each great enough to satisfy a pack of hungry gold prospectors. When Cairns was a port town in the days of World War II, toad racing was cutting-edge entertainment that drew sailors into the taverns. Today bars still promote toad racing to lure tourists within their walls. During our three-day jaunt aboard a scuba touring boat, we had the opportunity to make 11 dives, including two night excursions, each time in a different hot spot of the Reef. The crew took care of every other shipboard chore, from piloting the boat to refilling our oxygen tanks to cooking three meals and snacks for the divers every day. And what a place it is to dive. The ancient corals of the Reef have grown over many centuries into colorful and beautiful formations, providing an unmatched habitat for other sea life and an equally attractive environment for human visitors. Even as a rookie, I was able to identify more than 40 species which I listed in my journal. Lizardfish, sting rays, striped catfish, snappers, butterfly fish, flounders and fire coral are just a few of them. 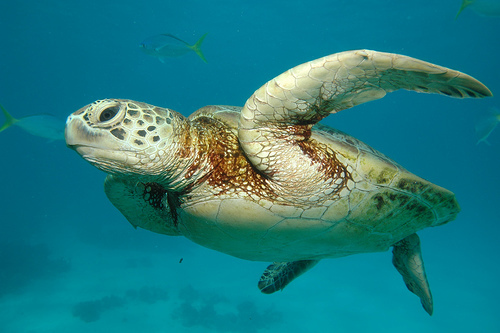 We also spotted a green sea turtle that was at least six feet from head to toe during our night dive. Our guide actually told us about him during our pre-dive briefing. “He’s friendly and nothing to worry about, unless you try to put him in a head-lock,” he joked. A school of barracuda was another memorable sight. Each of the divers on our boat enjoyed the adventure with no greater problems than fatigue. Diving so frequently for up to 40 minutes at a time was, in fact, a unique physical challenge, and we had to drink plenty of fluids to stay hydrated while breathing so much dry, bottled oxygen. I’m sure this concern was foremost on the minds of our fellow divers as they sat around the boat at night, drinking beer while they swapped stories, sang and laughed. As Dan and I suited up for our final dive, I was definitely sorry the voyage was coming to an end, but one more highlight awaited us. 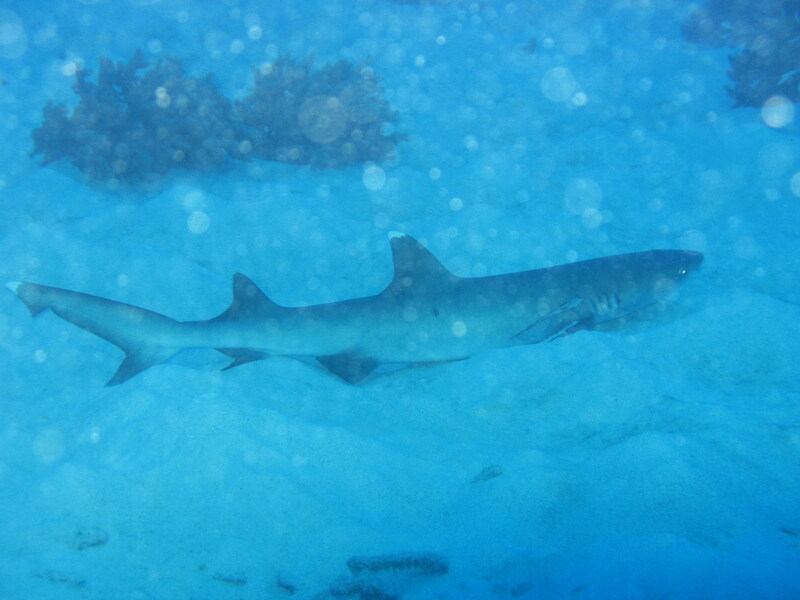 During our tour of a diving attraction called Coral Gardens, we saw clams five feet long, a big green snake called a moray eel, and for one fleeting moment, a hammerhead shark. While I watched in amazement, Dan kicked his legs in pursuit to get a better look. GETTING THERE: Don’t expect to find direct flights to Cairns. Most travelers will fly through Sydney before catching a connection to the scuba diving mecca. Qantas, Australia’s main airline, flies many connections daily; expect to pay about $600. HEALTH TIPS: Remember to bring motion sickness medication. The choppy three-hour ride between Cairns and the Reef nauseated many. CERTIFICATION: To participate in a guided trip, divers must become certified. Some beginners earn certification during such an outing, but taking a course ahead of time permits divers to tour more freely. BEFORE DIVING: A booking with most diving companies will include admission to a “Reef Teach” class in Cairns, offered Monday through Saturday evenings. This lecture and slide presentation is most entertaining and worthwhile. Read more at www.reefteach.com.ua.